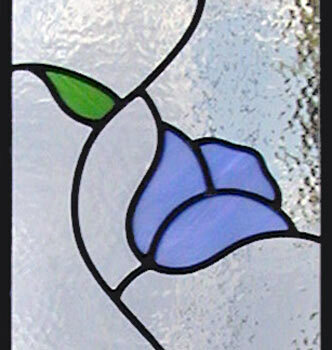 Tulips Stained Leaded Glass Sidelight Window Custom Glass Design. "TULIPSIDE" STAINED AND LEADED GLASS SIDELIGHT WINDOW CUSTOM AT GLASS BY DESIGN. This 5 blue tulips stained and leaded glass sidelight window was 12" x 65" with blue opalescent tulips, green opalescent leaves, and a clear textured background. This design can be rotated horizontally to serve as a transom.